We will be toasting one another and our friends this New Year’s Eve with ginger-infused champagne cocktails. The Gourmet Holiday issue this season was filled with inviting cocktails and hot boozy drinks. The sparkling ginger cocktail recipe caught my eye and I tucked it away, determined to try it during the holidays. Down to the wire as the calendar year comes to a close, we chose it for our cocktail tomorrow evening for a small gathering of friends from our neighborhood. So seldom do we drink sparkling wine that I usually opt for the best champagne I can afford when we do enjoy a bottle. The Gourmet recipe recommends Prosecco, which would work well for a large crowd of folks, but we will be an intimate gathering this year, so our sparkling ginger cocktails will be a fun splurge. I have modified the recipe to serve 4 generous cocktails but kept the ginger syrup proportions as originally suggested. Any extra syrup can be mixed with sparkling water for a refreshing and non-alcoholic ginger soda that rivals commercial ginger ale. I am a huge fan of ginger ale, my favorite non-alcoholic drink. TIP: The syrup can be made in advance and keeps for 2 weeks in the fridge. 1. Using a small saucepan, simmer the water, ginger root slices and 1/2 cup of the sugar for 10 minutes, uncovered. 2. Remove from the heat and allow mixture to steep for 15 minutes. 3. Using a fine sieve, strain the mixture into a small bowl. Chill until cold. 4. Using a food processor, grind the crystallized ginger with the remaining 1/4 cup sugar and pour into a small plate. 5. 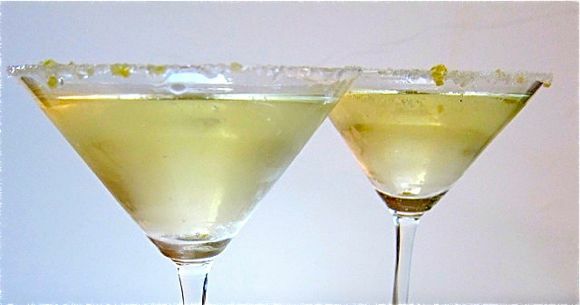 Use the lemon wedge to wet the rims of 4 martini glasses. Dip each glass into the ginger sugar. 6. Spoon one tablespoon of chilled syrup into each glass.Fill each glass with champagne. Serve immediately. I”ve made something similar to this many times and I LOVE it! This will be a great way to usher in the new year! Thanks – the ginger syrup makes a great homemade ginger ale too. Have printed this one off, I always keep both fresh and crystallized ginger at the house. This looks to be a delightful drink! Would love to have a cocktail with you dear. Have a beautiful New Year’s, I am wishing you the most peaceful, healthy and prosperous New Year, loads of happiness and laughter. Looking forward to our next reunion.Thinking IFBC in Seattle next August – Elizabeth picked it. X0 Thanks for everything. 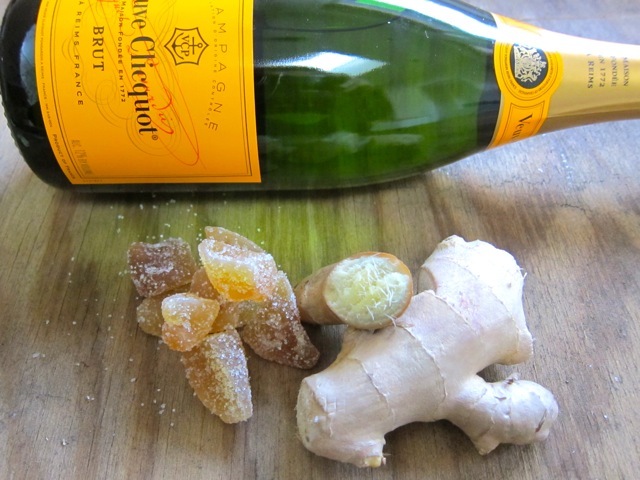 I love the idea of ginger and champagne. Luckily I have all the ingredients necessary to try it this evening. Happy New Year, Liz! This sounds so good! Have a wonderful, happy, healthy 2012! Hi Liz! I like your choice in the champagne! The yellow label was the first thing I sipped after I eloped to San Francisco last year. We sharted some at the Top of the Mark on a Friday afternoon. Hope 2012 brings you much joy, health and happiness. It was good to catch up last month! Absolutely great to see you and chat – love your most recent post. Your photos are so lovely! And I loved the chicken-egg color trivia! Happy New Year to you – thanks again for a lovely holiday party. This looks lovely, Liz! I love the idea of the ginger sugar too! !